The beach house "RIVALAGO" Lake Constance is stylish and modern furnishings, the rooms are bright and friendly. The house was completely renovated in 2015 with attention to detail and high quality. Two Custom bedrooms can accommodate four people. In design bathroom set Marazzi stone tiles and furniture handcrafted in oak rustic quality accents. The light-filled living room with large windows and direct access to the terrace offers a breathtaking view of the lake. In winter, the first-class fireplace creates a special atmosphere. This hot-air fireplace with big glazed Heiztüren is a custom-made master craftsmanship, which transforms the house into a year-round ideal retreat for cozy moments. a welcome refreshment. 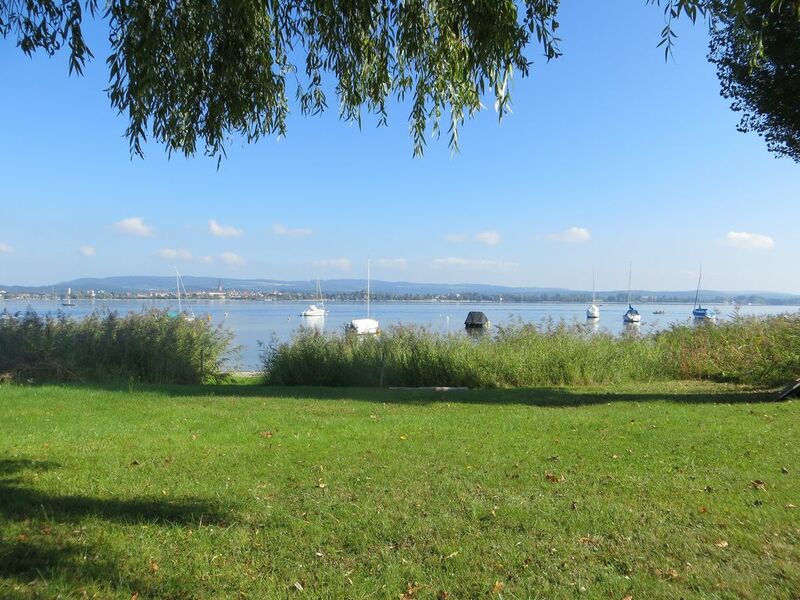 From the garden, guests have direct access and can cool off in the beautiful Lake Constance. The panoramic terrace is equipped with garden furniture and invites you to relax and outdoor dining a - a barbecue is available. Modern amenities such as satellite TV, Internet radio, dishwasher and wireless Internet access round off the holiday comfort in the property. Alles hat perfekt geklappt. Wir haben die Woche wirklich genossen. Das Haus befindet sich in einer Top Lage. Der Garten und der herrliche Blick auf den See, der direkte Seezugang und die zwei wunderschönen große Bäume sind perfekt. Das Mobiliar ist neu, könnte aber gemütlicher sein. Die Ausstattung ist gut. Der Kontakt mit den Vermietern war sehr gut und alles hat geklappt wie es ausgemacht war. Das Haus ist auf jeden fall zu empfehlen. Wir kommen gerne wieder. Mooi huis, strak afgewerkt, van alle gemakken voorzien. Het uitzicht is fantastisch! Goede bedden, alles is van hoge kwaliteit. Mooie omgeving, uitstekende supermarkt vlakbij. Aanrader! Das Haus befindet sich hinsichtlich Lage, Zustand und Ausstattung in einem hervorragenden Zustand, die Angaben in der Beschreibung waren in vollem Umfang zutreffend. Von Essplatz und Terasse herrlicher Blick direkt auf See, zwei wunderschöne alte Bäume sind als Schattenspender ideal. Das Mobiliar ist neu und hochwertig, die Ausstattung vollständig. Der Kontakt mit den Vermietern war nett und freundlich, alle Vereinbarungen wurden eingehalten. Ein Haus, in das wir gerne zurückkehren und das vorbehaltslos empfohlen werden kann. Wunderschöne Lage direkt am See, sehr gute Ausstattung des Hauses, sehr gute Vorbereitung / Betreuung vom Vermieter! Rundherum mehr als zufrieden, so dass das nächste Jahr dort schon reserviert ist :-)! On the Vorderer Höri am Untersee (the Wesltichen part of Lake Constance), nestled in an idyllic recreational landscape, the municipality is Moos with its districts Bankholzen, Iznang, Moos and hamlet. The beach house is located in RIVALAGO Iznang, in immediate vicinity of a nature reserve. A predominantly agricultural area than the rest of the undeveloped shores of Lake Constance on the typical products of the region are grown. In Iznang our guests can buy domestic products very fresh directly from farmers and fishermen. The widely praised and recognized excellent gastronomy in the immediate vicinity contributes to the well-being. The nearest supermarket (Edeka) with bakery and opposite drinks Abholmarkt are in Moos (2,9 km from the house). A cash machine and SB terminal Sparkasse hegau Bodensse is also located in Moss. Directly from the house you can go hiking, cycling and mountain bike tours in the beautiful scenery. A well-developed hiking trails along the lake on sunny fields or through shady woods you come to lookouts with stunning panoramic view of Lake Constance. The submarine has a varied and wide range of leisure activities for all water sports lovers. Whether sailing, windsurfing or canoeing, everyone can find a suitable pastime. In about 40 minutes from the beach house you reach the Rhine Falls of Schaffhausen, the largest and richest in water waterfall in Europe. Just a few kilometers from Lake Constance, the Rhine Falls Schaffhausen is one of the major attractions of this area. In Radolfzell approximately 4 km away from the house, there are also numerous cafés, shops and restaurants and a pier and a railway station. Another highlight in Radolfzell is the Bora sauna. The sauna area is beautifully located on Lake Constance. Set in the nature reserve of the carefully landscaped with mature trees sauna garden integrated with direct lake access. The city of Konstanz is about 30 kilometers away and can be reached by car, comfortably by train from Radolfzell or directly from the jetty in Iznang.